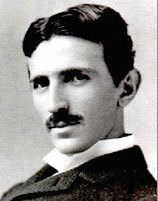 Born on July 10 (Gregorian Calendar) ,1856, Nicola Tesla is one of the world’s most important inventors. This Croatian genius who was proficient in 7 languages gave us the Tesla coil, the AC motor, the radio, the remote control and improved lighting. “In 1884, he came to the United States and worked for Thomas Edison. Tesla soon rose from the ranks and from a simple electrical engineer, he moved on to solving highly complex problems for Edison’s company. Sometime in 1919, Edison offered him $ 50,000.00 if he completed the motor and generator improvements. Tesla slaved for over a year to redesign them and gave the Edison company several profitable patents in the process.” When Tesla tried to collect the money as promised, Edison merely shrugged and laughed and told him that he didn’t understand American humor, then reneged on his promise! Edison even refused to give him a $ 25.00 raise . Taking it as the last straw Tesla resigned and worked digging ditches to support himself for awhile. It is said that the animosity between these two men were so great that both refused to share a Nobel prize and both promised to refuse the award if the other got it first. So neither of them got it. Things are not often as they seem and while we all credit Edison for inventing electricity, it was Tesla’s improvements on the lighting system that actually worked in terms of electrification on a larger and farther scale, as we know it now (electrification of towns, cities and fairs!). Everytime we drink ice cold water or cool some dish in order not to spoil, Tesla’s shadow looms within our refrigerator. It’s Tesla’s coil running the motor of the device conceptualized by George Westinghouse. Here we see the difference in respect and affection for both men as against that of Edison. When Westinghouse was going bankrupt, Tesla dissolved their contract by refusing to accept royalties for his invention, thus saving Westinghouse several thousand dollars and saving him from bankruptcy. We now enjoy listening to music or soap opera or programs in the ubiquitous radio, which Tesla again invented and music lovers all over the world have much to thank him for. He died of heart failure in January, 1946 in a New York hotel- alone and penniless. Tesla was so engrossed with his work, his inventions and ideas that he never had time for love. It is said that his eccentricities were so great that he will eat his food only when cut in precise manner and number of pieces.Later on when he became old, he was tagged a “mad scientist” for his outrageous claims. But that could not outshine his genius and his numerous inventions. Also a poet by heart, he is one of the most revered engineers ever to have walked on this earth, and rightly so.